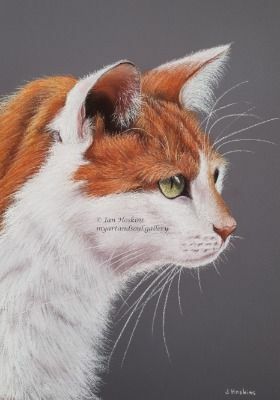 My lovely cat took second prize at the awards evening of our new Easter Exhibition. With grateful thanks to Birgit Meyer for the amazing photo reference I worked from. There is a fantastic display of artworks up in the gallery, all by local artists, so do pop in if you get the chance. We are above The Museum in John Street, Porthcawl. Best day to visit is a Saturday. 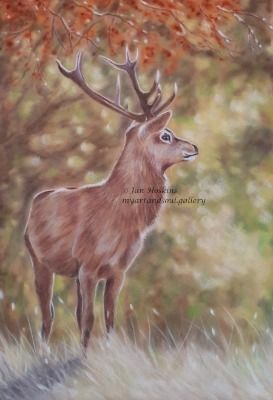 The beautiful deer is complete, have spent a lovely afternoon adding the detail and tweaking here and there to bring today`s painting session to a close. Have really enjoyed painting this one. 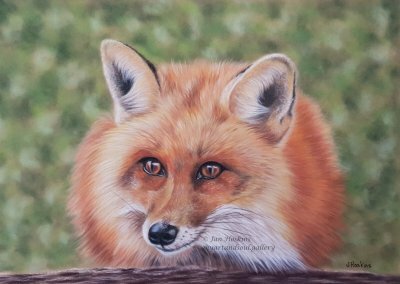 Can`t wait to see it in a frame, and all ready for the next Exhibition at Porthcawl Art Society. 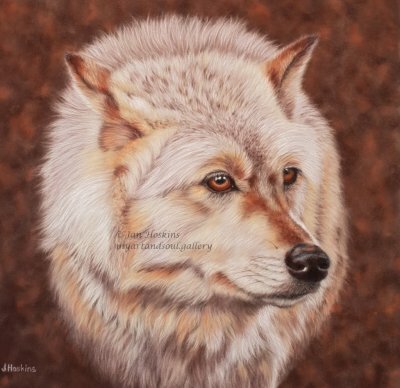 Photo reference by kind permission of Terence Porter who`s photography is absolutely stunning by the way. The initial sketch is complete with some light base colours added in too. 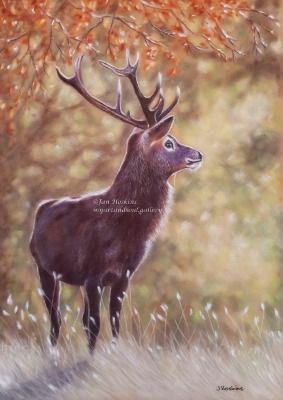 So many different colours on this beautiful deer`s coat, oranges, reds and a lovely velvety purple too. I am really looking forward to putting the background in on my next session. With grateful thanks to Terence Porter for the great photo reference to work from. The beautiful cat is complete. 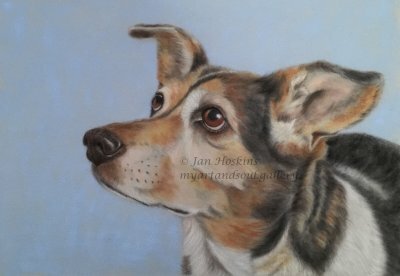 I have found this pastel paper very tricky to work on, but I do like the overall effect, and am pleased with how she has turned out, even though it has been rather a challenge. 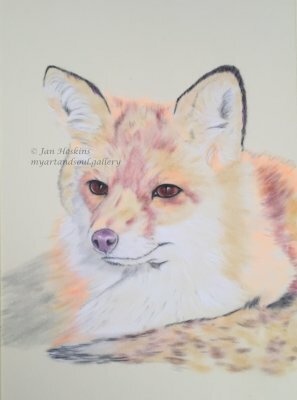 Photo reference by kind permission of Birgit Meyer to whom I am most grateful. What on earth would I do without these talented photographers ? 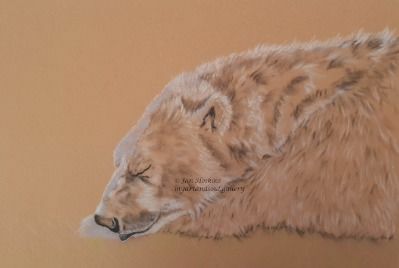 This lovely polar bear has given me plenty to think about as I have worked on him, so many things have not gone according to plan, and as such, I have had to make so many adjustments. I have changed the background almost completely to try and put him in a more appropriate scene for a polar bear. Grateful thanks to all who have made helpful critiques along the way. It has really helped and I hope you like him now, I am certainly feeling much happier with my sleepy head. Extra special thanks to Bob Barton for the most amazing photo reference to work from. 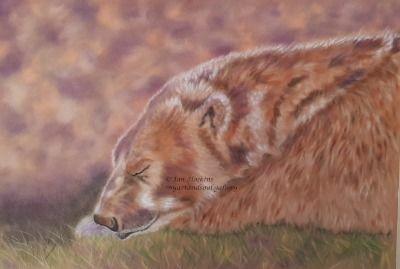 Have darkened the background around the bear to ensure he stands out more and the grass has been thickened up too. 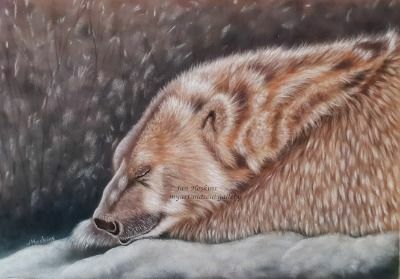 I have also started to work some detail on his fur, the highlights will be put in last so he is still looking quite dark for a polar bear right now. 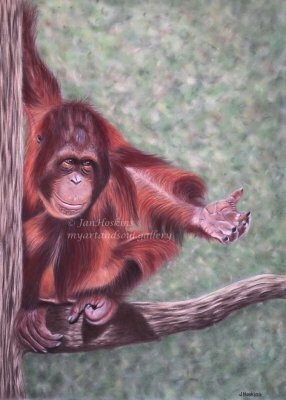 After receiving some feedback on this painting I am now thinking of changing the background...this is going to be tricky...will be interesting to see how it turns out...watch this space ! Have blocked the background in on this session but must admit am unsure about it at the moment. 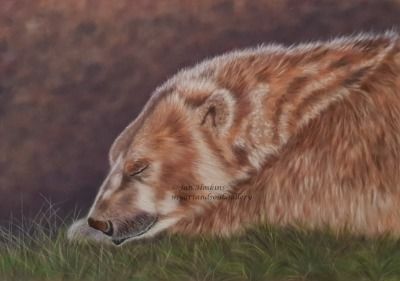 The undercoats have been added to the bear with some of the highlighted areas worked on too, his colours will change quite dramatically as my work on him continues, we tend to think of a polar bear as white but it is surprising how many colours I can see in his fur from the photo reference I am working from. Back to my `other world` and my first painting of 2019 on the drawing board at last. This polar bear has taken my fancy this time, he looks so peaceful snoozing away there. 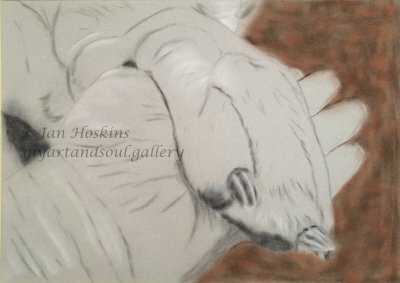 Am working on a sand coloured paper and the initial sketch is complete with just a hint of colour added here and there. With grateful thanks to Bob Barton for the fantastic photo reference I am working from. It is always tricky trying to think of a good title for finished work. 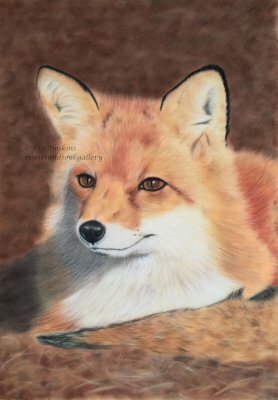 Leaving this one as `The Fox` for now. Suggestions always welcome. All the detail work completed today and the eyes and nose have been given a bit more zing to make them pop too. I think I am ready to call this one finished now. I hope you like him. Special thanks to Samantha Georges for another amazing photo reference to work from. 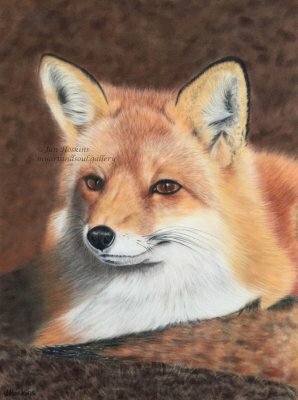 I have chosen a simple background which didn`t take long at all and then set to work on his features strengthening those gorgeous eyes and that cute little nose. He is really coming together now with just the detail work to complete. 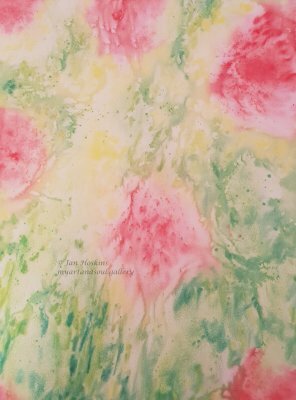 Have completed the background which is worked in wet into wet watercolour, it`s a really fun exercise as it`s just a matter of wetting the whole sheet of paper and then dropping the different colours in, it`s a lovely effect. The main subject will be worked in pastel over the top of this base. 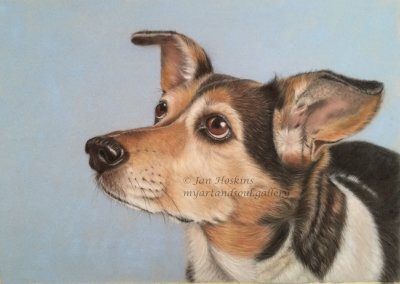 This is the little dog Rex all finished (I think) I would like to say that I`m all better now but unfortunately not. I seem to be stuck in a bit of a painful place making very little progress with my recovery. 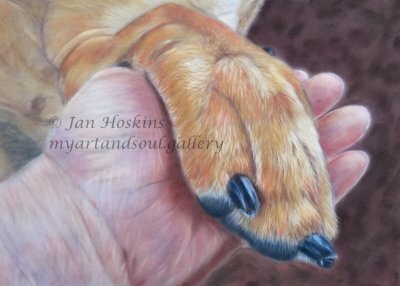 Am hoping my art may help in the coming weeks, I have rested enough, it`s time to push to get myself back to normal now. So, although little Rex has pained me a little along the way, I am treating this as therapy from now on, it`s much more interesting than physio and it`s definitely getting my arm moving a bit more. It took me ages to decide what to do for the background, this grass effect works rather nicely I think. The final detailing has taken me several on and off sessions but I made it eventually and I think he was worth the wait. He is a cheeky looking chap isn`t he ? After dislocating my right shoulder over the August Bank Holiday Weekend I have been out of action for the last couple of weeks. The little dog has just been sitting there looking at me, and I him, recovery has been very slow and difficult as I`ve not been able to do anything much at all. I decided to grin and bear it today, kill or cure as they say. So, I worked for a bit and then rested a while and time ticked by without me realising how long I had spent in my other wonderful world. 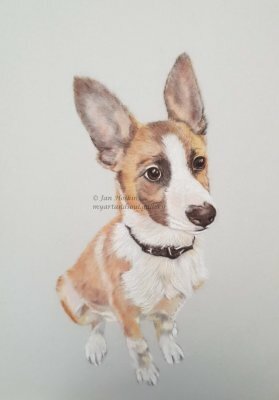 My little dog is starting to come together, but there is still quite a lot of work to do yet and, of course, the background...I need to make my mind up about that. Not now though, as I am suffering a bit this evening, so it`s time to rest and recover a little more before I attempt another art session ! 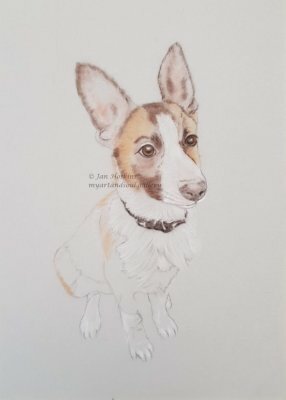 This lovely little dog is a commission that I have recently started. Have not followed my usual routine with this artwork so it will be interesting to see how I get on with it. 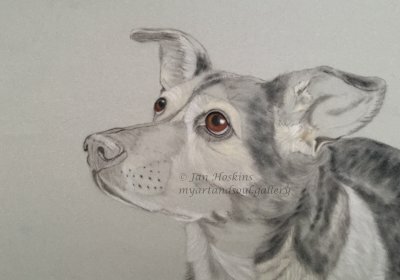 They do say that a `change is as good as a rest` though so hopefully all will be ok. After sketching out I have concentrated on the head area, with an initial colouring of the eyes and nose put in, a little work on the collar and some blocking in of the base colours on the head and ears. Am unsure what to do for the background colour so will leave that for now ! 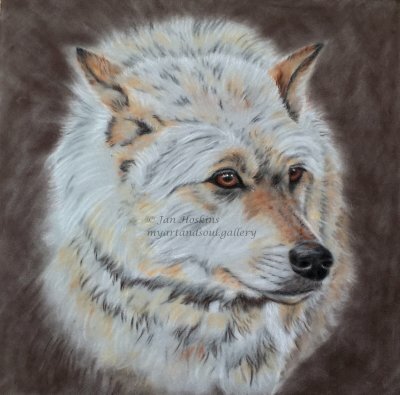 Here is the lovely wolf all finished. 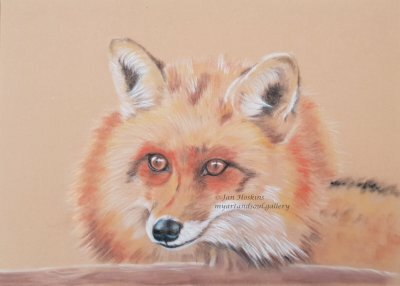 Have added a lovely warm orange to the background colour to compliment the colours of this beautiful animal. The rest of my time has been spent on all the detail work and adding the final touches to the eyes and nose too. He is looking rather handsome I think. With grateful thanks to Paul Fine for the fantastic photo reference I worked from. 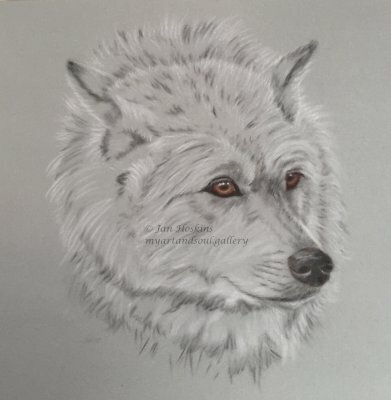 Not a great deal of progress since my last post but the background has been blocked in lightly, some of the base colours have been added to the wolf too along with a bit more work to the eye and nose areas. 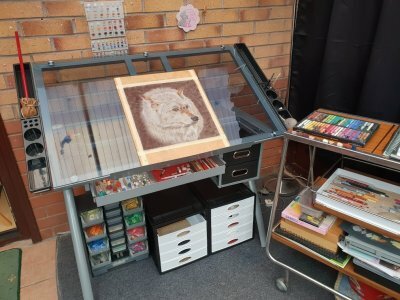 My artwork is a bit slow of late as the lovely weather is affecting my time spent in `The Studio` (Conservatory). It is just too hot in there for the majority of the time. I have turned my attention to other things instead and am building a little book of watercolours, mainly from early morning walks, they are just rough little paintings really but am enjoying making these little memories of time spent outside walking along the coast/countryside and the odd weekend away too. This has also led to me rejuvenating my interest in collecting geocaches whilst out and about too. 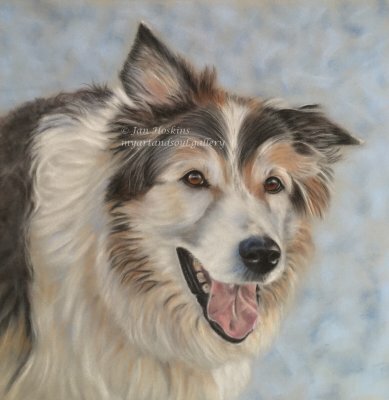 I love the colours in this gorgeous dog and she is progressing beautifully. 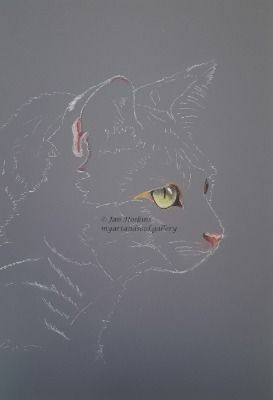 All the base colours are in now and am just starting to build up the layers of her lovely thick coat. Lots of work completed today on her eyes, nose and mouth with just the final detailing to add in these areas. Am really looking forward to spending some more time working on her again soon. 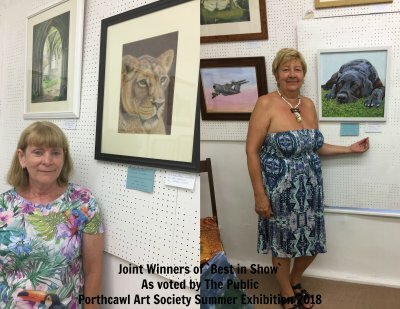 Absolutely delighted to share the `Best in Show` prize, as voted by the public, with my fellow artist and friend Lydia Nicholson at Porthcawl Art Society Summer Exhibition 2018. 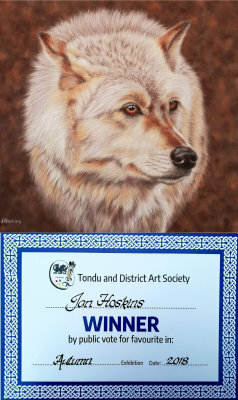 It was such a lovely surprise to hear that we were joint winners for this new award that has only just been introduced within our art group. With grateful thanks to everyone who visited and voted. We are chuffed to bits ! With such an abundance of fantastic artworks in Porthcawl Art Societys New Summer Exhibition. 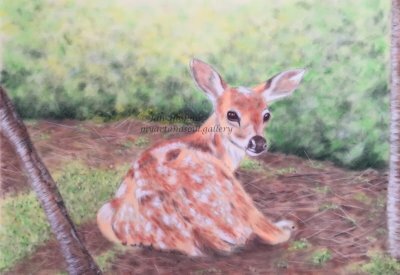 it was so lovely to be awarded highly commended for my pastel painting of the beautiful fawn. 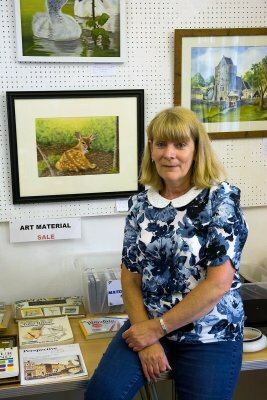 We were delighted to welcome our judge, Vicki Washbourne, who is a member of Tondu Art Society and an amazing watercolour artist. A good time was had by all who attended our awards evening. Our new Exhibition is now open and there is a lovely variety of different subjects to view up in the gallery. 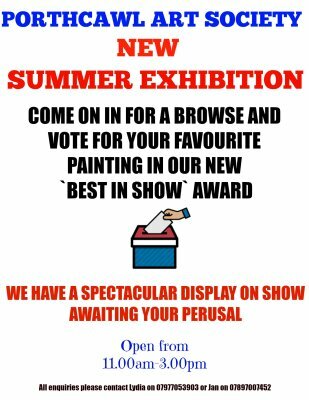 We have also included a new award this time, asking our visitors to vote for their favourite painting to determine our `Best in Show` winner (as voted by The Public). The voting for this award will continue over the next two weeks. 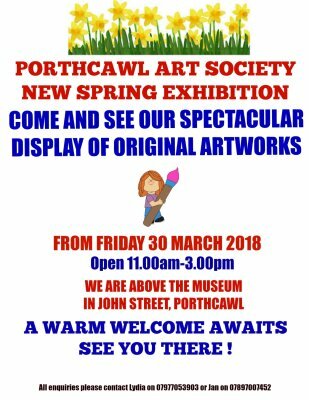 We are open again tomorrow (Sunday) from 11.00am until 3.00pm and are at The Old Police Station, above The Museum in John Street Porthcawl if you fancy dropping by. 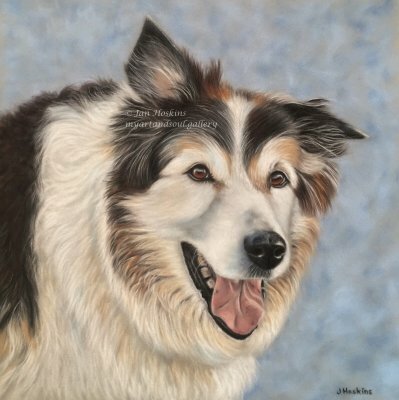 A commission worked in hard/soft pastel from owners own photo reference. 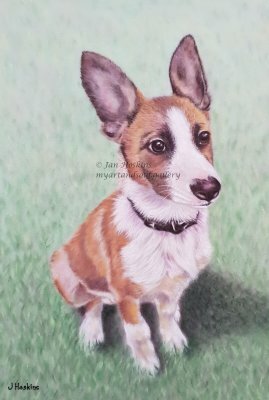 This handsome dog has taken me some time to complete. Very tricky working on all that hair I must say. 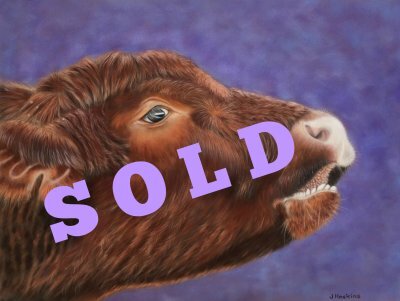 Am pleased to report that his owner is delighted with the finished painting. Fantastic news ! 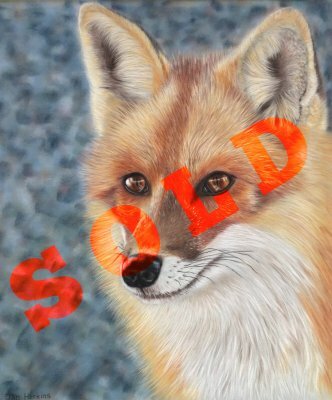 So thrilled to see this beautiful fox painting from our Animal and Wildlife Exhibition in The Pavilion Porthcawl go home with my biggest fan today...my Mum. 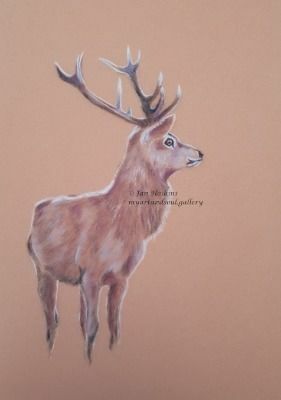 A favourite subject of mine so am sure it won`t be long before I have another one on the drawing board. It`s been a glorious day spent with family who travelled down especially to view my current artworks on exhibition. Good times ! 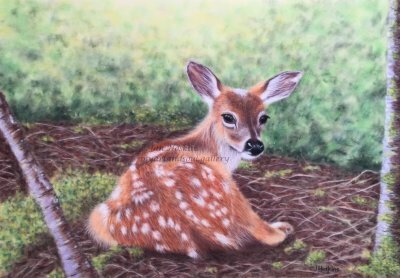 With grateful thanks to Samantha Georges for the fantastic photo reference I worked from to produce this pastel painting. 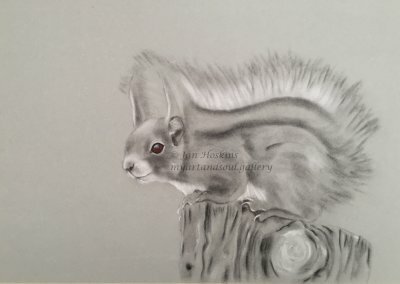 I went to a demonstration evening in the week and decided to try out some of the techniques that the artist (Graham Cox) showed us. We all really enjoyed the evening and today I also really enjoyed working on this beach scene. It`s worked in hard/soft pastel on a smooth paper. Have not attempted anything like this for several years but am pleased with the results. I may even do another land/seascape some time. With grateful thanks to Pauline Capewell for the photo reference I worked from. Have made some more progress today. 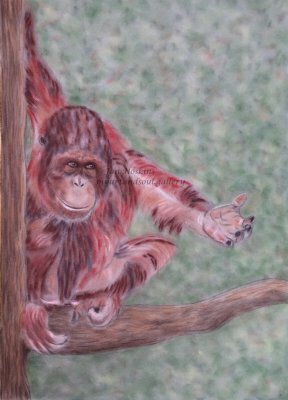 Am surprised how tiny the eyes are on the orangutan, quite tricky to work on but looking good so far I think.. The tree is starting to come together a little bit now too. All the base colours are in at last so will be starting all the detail work on the next session. Our Exhibition is now officially open ! 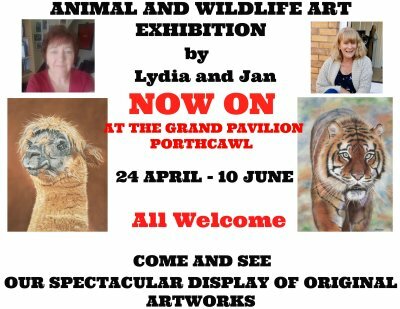 It`s been an extremely busy and exciting time in the run up to the launch of our first Duo Exhibition at The Pavilion Porthcawl. 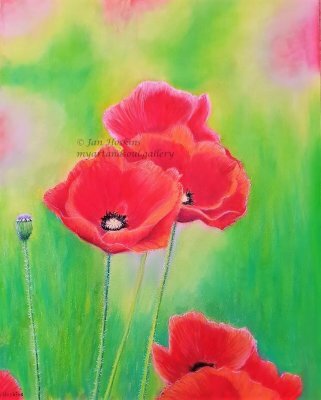 Time to relax a bit now and get back into some artwork again as the Exhibition runs on. Hope that all the visitors enjoy seeing our work. What a night. The weather was absolutely atrocious with wind and non-stop rain. We didn`t expect anyone to come. But we were pleasantly surprised, and we all had a lovely evening. And they are up ! Have spent the morning at The Pavilion with all the paintings going up and down and here and there to get it all just right. The picture on the right shows one section complete. Between us, Lydia and myself have thirty five paintings in this exhibition. It all looks amazing...can`t wait for the launch now ! Final stages underway today, it`s surprising how long it`s taken to get everything ready. A few hiccups along the way too but have managed to overcome them all, thankfully. Heidi is saying: `Have you nearly finished now ?` Me:`Yes, almost ready Heidi...only the packing up of them all now, finding a way to fit them in the car and then we`ll be home and dry` Excited muchly ! Chose these cute little piggies for a quick study with some mixed media for a change today. 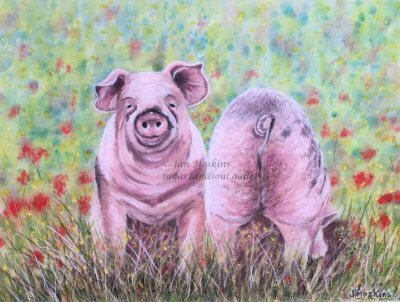 I used watercolours first on the background and the little piggies and then added some pastel for a bit of texture. A fun little exercise for a Sunday. With thanks to Kerli Toode for the brilliant photo reference to work from. Have had a couple of hours to work on this lovely piece again today. 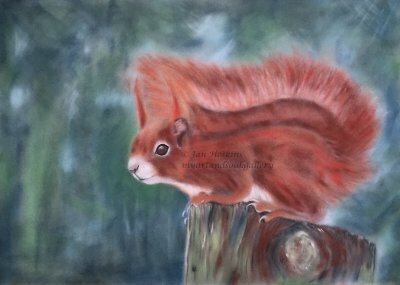 The background has taken up quite a bit of time and am pleased with the overall effect although I am not too happy about the tree trunk on the right at the moment. 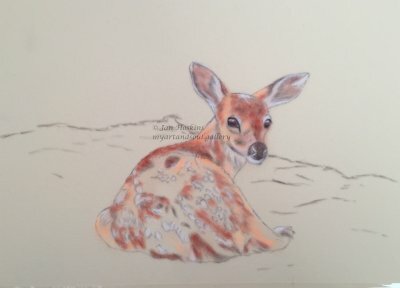 A little bit more work completed on the fawn with further work on the eyes and nose too. 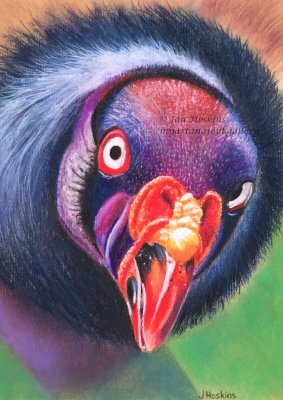 I was delighted to be awarded third prize for my King Vulture at Porthcawl Art Society Spring Exhibition. I was certainly surprised as he is such a mean looking bird, but he is also full of character too. Anyway, he caught the judges eye that`s for sure. 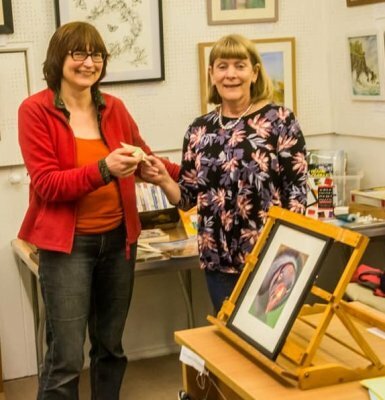 Here I am, with Lesley Dearn (our Judge this time) who is an accomplished artist teaching and running workshops and classes in the local area. New Exhibition opening on Good Friday ! 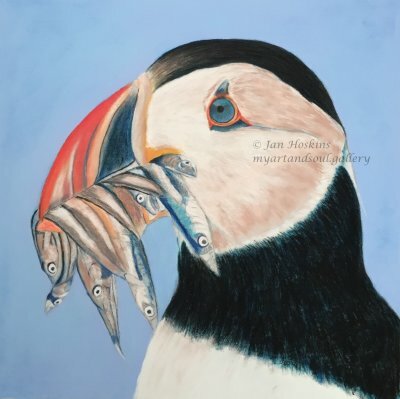 I have spent a lovely morning working on the puffin with his catch of fish. I think he is now complete as I have strengthened all the lights and darks and worked all the detail too. Another painting ready for my April Exhibition ! A bit more progress made today, am away from home at the moment but decided to bring my artwork with me in the hope that I might get some time for it. 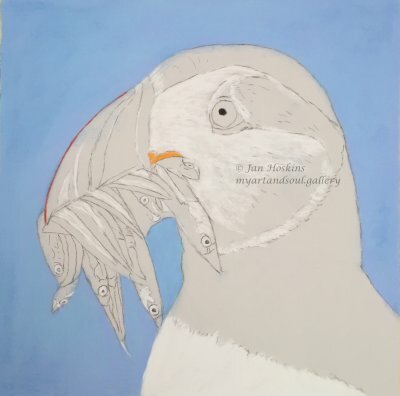 I have chosen a pretty puffin for my next piece. Another bird with beautiful, bright colours. Nature is such a wonderful thing ! Am working this one on pastelmat which I am finding is a great paper for birds especially. It is totally different to the paper I usually work on though so it does take a bit of getting used to as I adjust to it. 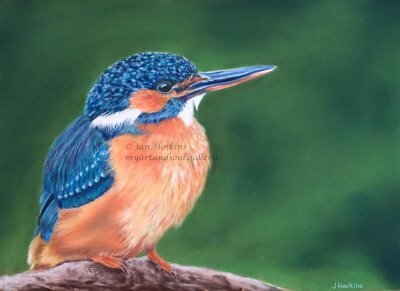 I have selected a lovely light blue for the background which I think will enhance the birds colours even more. Have reserved some of the whites and am just starting to add a bit of colour. 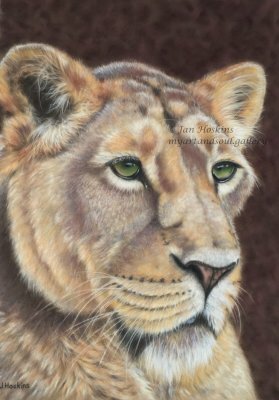 This next stage hasn`t gone to plan and I have darkened the background now to enhance the lioness as she seemed to have faded into the other, more natural background. I have spent alot of time going over the detail work too. It`s time to stop now though and call her finished...so here she is ! The second step is complete, have strengthened the base colours and the background. She is very colourful right now but the detail work to go on top will tone it all down. 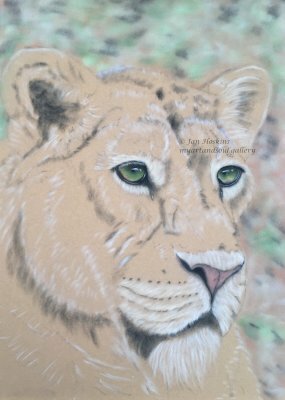 The start of a lioness with such beautiful green eyes. 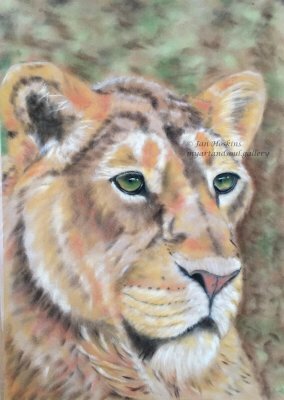 This is on a sandy coloured paper which compliments the colours of the lioness. Sketched out in black and white with some colour added to the nose and eyes. The background has been blocked in lightly too ! 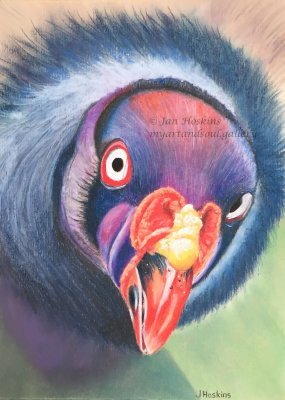 I sprayed him with fixative before continuing further but found it difficult to add any more layers on top, have managed to strengthen the colours though and now this King Vulture is ready for framing ! He is like marmite...you either love him or hate him but his colours are just so beautiful aren`t they? 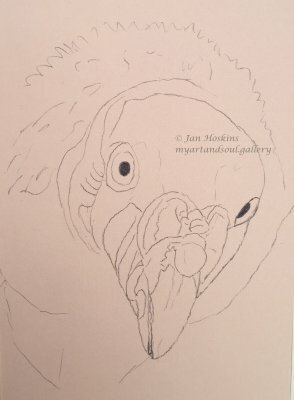 I am not keen on the paper I`m using but I have made good progress with this bird artwork today. All the colours are in and blended, just needs some shadow on the right hand side and some highlights and I think he will be finished. This is just a quick study really, am using a different paper again...I wonder how I will get on with this one. So, just the basic drawing completed so far. Am looking forward to the next step as the colours in this bird are absolutely beautiful. Looks like he is complete. 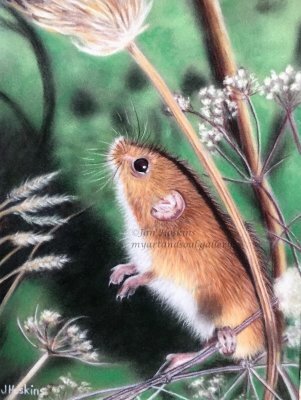 A good choice to choose a little field mouse for a little painting I think. He is just so cute and definitely worth all the fiddly bits I encountered while working on him. All the background colours have been strengthened again to ensure the detail work stands out. 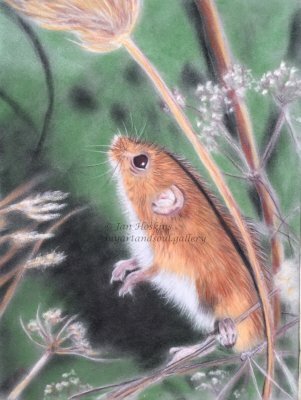 Have spent a fair bit of time on my little mouse again today, it`s trickier when working smaller I think and it seems to be taking me longer than a larger piece. 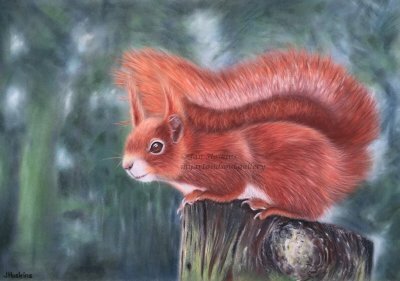 Have strengthened the background and the base colours on the little fella. Just starting to work some of the detail too. He is very delicate isn`t he ? 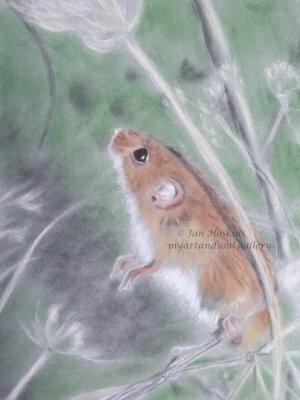 This little field mouse is on the easel today. Just light base coats in so far and the beady little eye. Looking very cute there where he is perched I think. Am working on some smaller pieces now and this one is just 6" x 8"
Am using a different paper with this new artwork I have started. I have many different pastel papers to choose from and am thinking it is time to use some up. It`s coming along ok but I am already wishing I was on my favourite paper instead now. 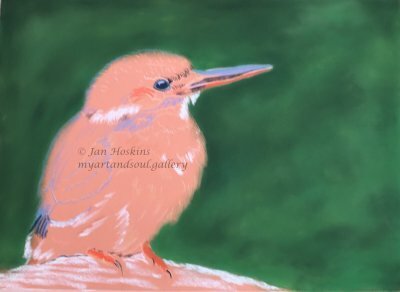 Anyway, I have blocked in the background, worked briefly on the eye and just made a few marks on the bird itself so far. All the base colours are in and the squirrels colours look so striking and beautiful. He looks like he is about to pounce I think, I wonder what he is after ! 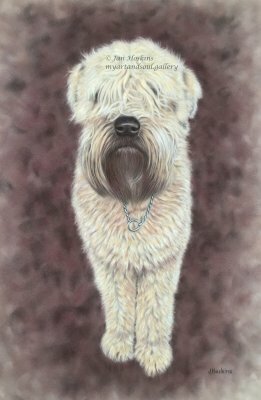 This beautiful dog is complete after a few more hours of detail work and a bit of tweaking here and there. Am extremely pleased with the end result and am thinking I will call this one `Anticipation` Now, what shall I do next I wonder ? 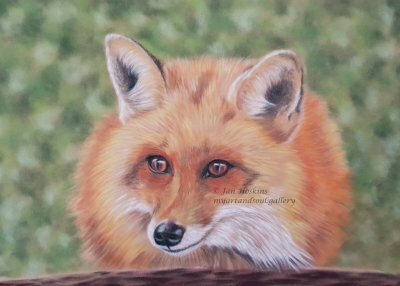 Today`s progress, all the base coats are in now, with some further work completed on the eyes, that left eye is looking much better now. I have also spent some time on his nose today too. 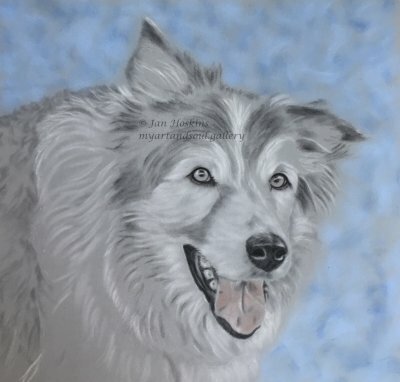 Have put a light background in which will probably stay light as I really like it as it is (at the moment, anyway) She certainly is beautiful isn`t she ? 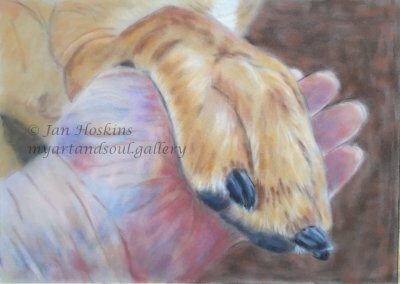 I have altered the paw just a touch to soften off a little. I think it has improved the overall look of this painting. 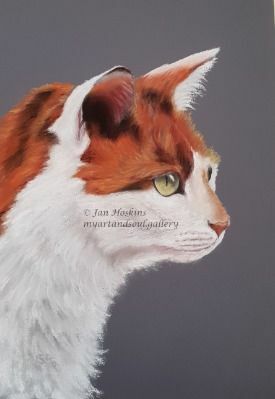 I am very happy with the way it`s turned out and I am extremely grateful to June`s Reference Free Photos for Artists for permission to use her photo to work from. Another piece complete for one of the exhibitions I have coming up. It`s Saturday and I can spend the whole day `lost` in my other world, Bliss ! 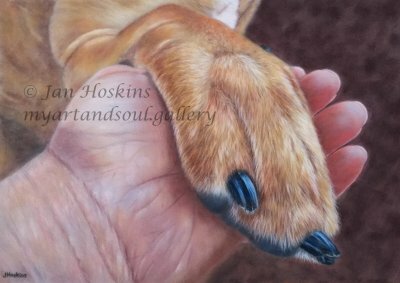 Well, the morning has flown by but I have made good progress and just as I am starting to get engrossed in adding the detail work I realise it is lunch time already...back soon ! 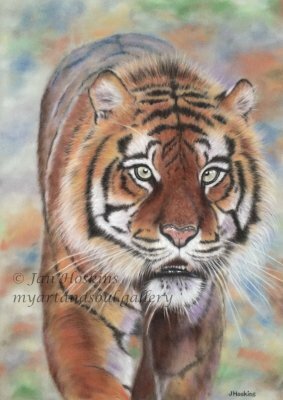 Well I have spent the whole day working on this tiger and I have enjoyed every minute. 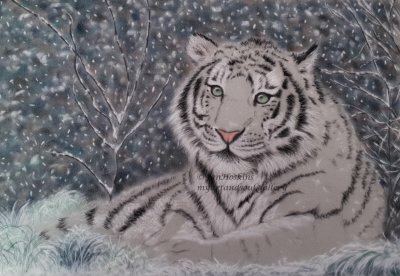 This afternoon I have strengthened the eyes and the background and then worked on all the detailing everywhere else. 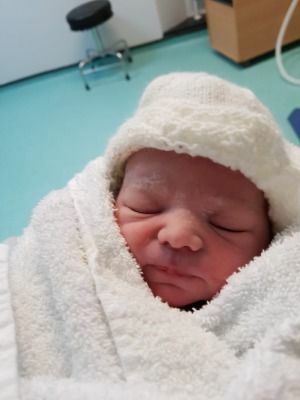 I am delighted with how he has turned out, it`s just been one of those days where everything has gone to plan thankfully. 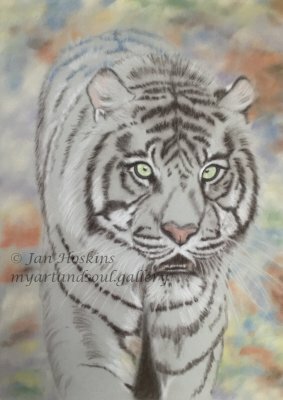 I love him...and I now have a title for this painting - On The Prowl ! 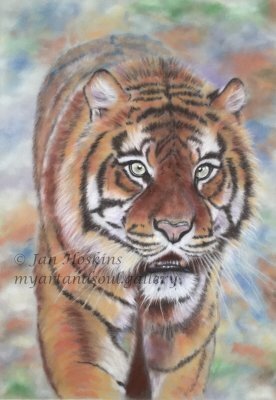 Was up very early this morning waiting for it to get light so that I could continue with the lovely tiger. 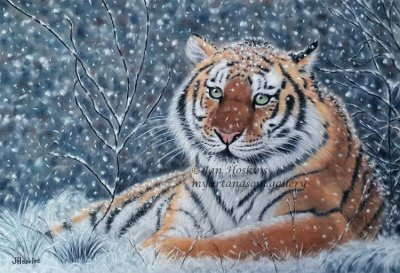 Have made excellent progress, lots of work on those gorgeous eyes and have blocked in all the colours on the tiger and strengthened the background a little too...time for a lunch break now...back soon. 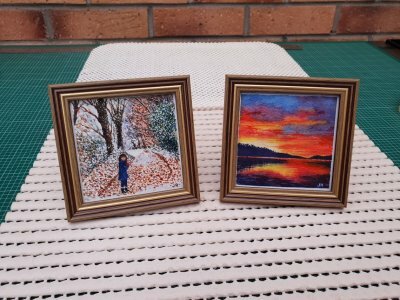 I have two new exhibitions coming up in a couple of months time so I really need to get cracking on completing some new artworks to put in. 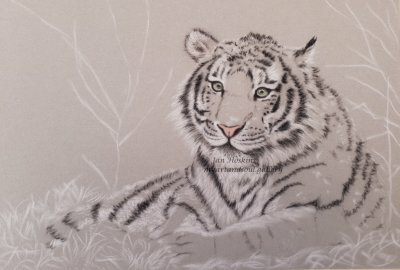 I have chosen this beautiful tiger for my first new piece. The initial sketch is complete with a touch of colour here and there and I have also blocked in the background lightly too. Am pleased with today`s progress and am looking forward to working on him again tomorrow. With thanks once again to Chris Allsebrook for another fantastic reference photo to work from. Rocking in the New Year !